With the 1200cc Ducati Monster coming over the hill (sorry…), we thought now would be a good time to look back at the 1100 EVO. Here’s the 2011 launch report. This Monster 1100 Evo will replace the two current versions available. Could it be a case of Monster ambition outweighing Ducati talent? Step this way and find out. 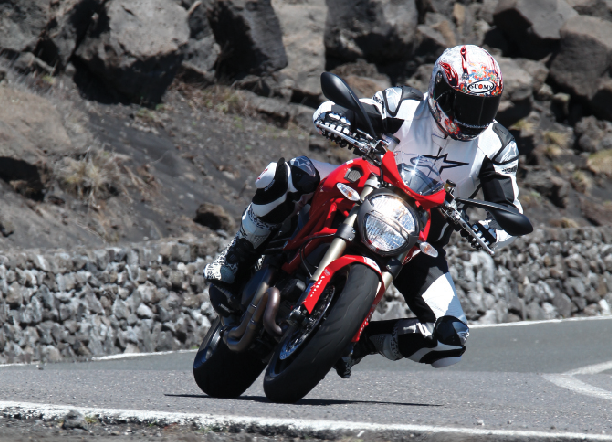 Ducati Monster EVO is ace, unlike that helmet. 1993, what were you doing? Have a think. Ducati were yet to gift us the 916, current Ducati MotoGP wideboy Valentino Rossi didn’t have a single world title to his name, team mate Nicky Hayden was 12 years-old and Ducati had just launched the Monster. In comparitve terms there is nothing the two racers could ever achieve riding red that would match the success of the Ducati ugly duckling. If you can think of a three digit number, Ducati have probably made a Monster with an engine capacity to match. From the strangled 43bhp 400 to the straining 130bhp 1000cc S4RS, 11 engines of varying capacities have hung from its pretty trellis frame, this 1100cc air-cooled desmodue is the latest. It wasn’t that long ago that Ducati launched the 1100, 2008 in fact. I attended the launch (for a struggling TWO bit magazine that’s long since died a digital death) and came away impressed with the bike, more importantly impressed by Ducatis attitude. 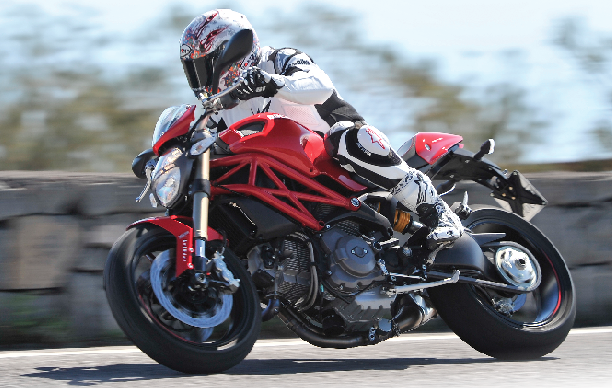 Less than six months earlier, when they launched the all new Monster 696, I got off feeling a bit non plussed. No power, light switch fuelling and a seat that tipped you into the tank. It’s not much fun using your scrotum for a seat you know. Ducati listened to what we (assembled journalists) had to say though and set to work making improvements behind the scenes to the 1100. By the time we were invited back to ride it you’d never have known the two bikes were related. If they weren’t visually identical, of course. 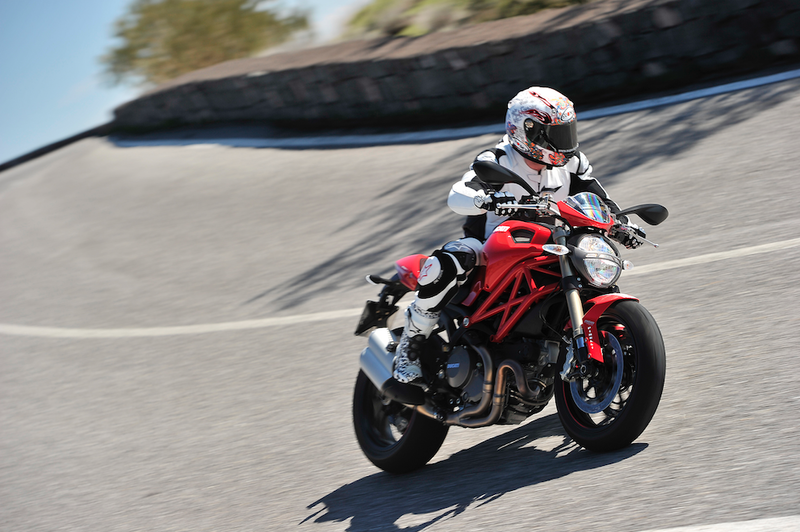 Ducati Monster, still going strong after all these years. It seems strange, then, that in their eyes the market is ready for yet another 1100cc Monster. But they are, and so confident of the fact that they’ve decided to axe the standard and the S version from the line up in favour of this, the Evo. Far more than just a funky name change with its own range of lucrative branded merchandise, the 1100 Monster Evo is a complete rework of the important bits. The looks remain largely as was, the thinking being that they didn’t need any work. I agree, it’s a pretty looking thing. The engine has had a shed load of work done on it. Where the outgoing variant had four valves per cylinder this one only has two, but thanks to reprofiled pistons, a revised airbox, increased valve lift on both intake and exhaust stroke, some clever work with a Dremelo (it’s the Italian version) on the intake ports and a compression ratio increased from 10.7:1 to 11.3:1 the Evo puffs its burly red chest out to the tune of 100bhp. Yes that’s down on the 120bhp that the outgoing 1100 had, but this is an air-cooled two-valve motor people. It’s a figure to be proud of. Especially when you consider that the service cycle is now 7,500 miles. Visually the engine doesn’t look any different, but the use of the cannon style 2-into-1-into-2 exhaust similar to the one on the Diavel certainly finishes the mechanical rework nicely. Not only does it sound sweet, it also cleans up the back end of the bike a treat. I always thought the old style pipes were trying a little bit too hard to mimic the Triumph Speed Triple. Not even the most ardent Triumph fan could argue that Brian from Hinkley knows more about making pretty bikes than Gianni from Bologna. 100hp motor is more than up to the job. Ducati has plumped for Marzocchi forks, favouring them over the too expensive Ohlins and the too regular Showa units previously offered. The thinking being that the 43mm fully adjustable set-up from Marzocchi provides the performance level they wanted without pushing the price of the bike out of reach (there was me thinking it was because they were Italian, silly me. A progressive Sachs monoshock with adjustable preload and rebound hangs in the back. The radial mount four piston Brembo brakes now sport Bosch ABS, which forms part of the Ducati Safety Pack (pronounced “say fatty packa” in the presentation, I didn’t laugh, much). A four mode traction control system forms the second part of the say fatty pack. This is the stand out technical upgrade on the bike, surprisingly it comes as standard on the Evo, which if you’re not a fan of reading the spec box at the end, costs £8995. That’s less than an ABS equipped Yamaha FZ8, Honda CB1000R or Triumph Speed Triple. 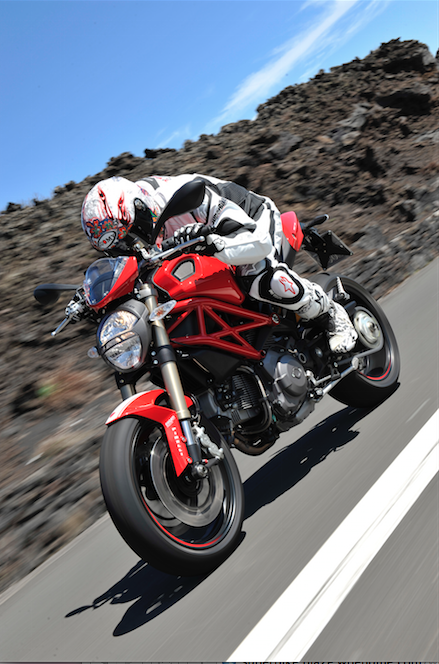 It’s no wonder Ducati UK have just posted their best first quarter sales performance since 2004. Swing a leg over the resculpted seat (with added go faster stitching) and you’ll find tweaks to the riding position. The bars sit 20mm higher than they used to as well. Though the bars are the same shape and size, that tiny difference in height had a tiny negative impact on my wrists but a huge positive impact on the view the mirrors provide, a trade off I was more than happy with. Tight as a drum tickover follows, the staccato thrum of the dry clutch is missing. Instead you get a finger light hydraulic multiplate system lifted from the parts bin marked ‘Multistrada’. A smooth move in every conceivable term. I pulled away expecting the Evo to try and leap from my hands in the same excitable fashion that the old version did, and have to admit to wondering what the hell was going on when it didn’t happen. Sicily is a bloody long way to go to find a bike has been improved by making it slower. I couldn’t fault the fuelling though, much smoother and less erratic than it used to be. On a constant throttle, where the old one would hunt and lurch, the Evo holds revs and speed perfectly. Don’t be tempted to clog past second gear at round town speeds though as you’ll be greeted with a sack of drive train shunt and the sound of mechanical unsympathy that’ll make your eyes water. I would later find the perfect gear for every situation, ranging from knee down hairpins to wide open 100mph sweepers. Once you’ve experimented you’ll do the same. As soon as was feasable on the twisting and testing roads surrounding Sicily’s Mount Etna I revved the Evo out in search of a hidden crevice of power. I’ll be honest, I didn’t find one. In reworking the motor, Ducati have pushed peak power to 7500rpm, which is fine, but the rev limiter lurks just 600rpm (indicated) later. The motor spins up freely (the flywheel lifted from the 848 helps) and the power delivery is constant, but it lacks that dangerous/brilliant feeling the 120 bhp four-valve motor had. A couple of times I opted to hold the bike on the super soft rev limiter on the short straights that seperated the second gear corners on the test route, I might not have been going as quick as I would have been had I snicked third for a second, but it saved me from shifting a gear that I’d only be in for a blink of an eye anyway. The brakes are a big improvement over the old model. Where the old ones would smack you in the mouth the moment you brushed a finger on the lever, the Evo provides stopping performance that feels the same but the lever feel is much more telling, I much prefer this set-up. I think the improved feel is also down to those Marzocchi forks. The whole fornt end package feels very plush from the moment you brake for a corner all the way to the exit. If that helmet was normal, he’d be getting his elbow down round there. Initially I felt like the Evo was too twitchy for my liking, the rate that it can change line mid corner took some gettng used to. It took me a little while to work out that the leverage provided by the bars was huge and me pushing and pulling on them mid corner was what was upsetting the bike. Once I’d set the Evo up for a corner, if I left the bars alone I could add throttle and really fire out on the exit, if I had to change line then a roll of the throttle usually followed, losing us speed and dropping me off the back of that peachy mid range torque. Not once during normal riding did I find the traction control cutting in, regardless of mode. This is the lowest powered bike on the market with traction control, I’m not saying it doesn’t need it because it helped on a couple of corners where volcanic dust (not ash) had gathered, as did the ABS. For that reason I think it’s a brilliant addition to an already very good bike, especially when you consider the price. Getting it right on the Evo does require some time and effort, whether that’s in town filtering through traffic or riding as fast as you can down your favourite road. The reward is an involving ride that might not set your pants on fire down the straights, but is more than up to the job of handling anything you can throw at it in the corners. Don’t read the above and expect the Evo to be slow, once I’d got the measure of the very slick (and completely false nutral free) gearbox I found it easy to tap into the fat midrange, once you’re riding that you don’t notice the apparent lack of top end power. I decided that 100bhp might not be as much as the immediate competition, but in the right hands it’d be more than a match for most riders on most bikes. Ten years ago you’d have been lucky if two electrical connectors built on the same day were capable of working in unison on a Ducati. Nowadays the Siemens fuel injection is happy to sing along with the Bosch developed ABS and traction control ECU, which to me speaks volumes about how much the brand have improved the quality of their products. Yes, there’s a mind boggling amount of accessories that Ducati would like you to buy with this bike, but they don’t exist to dress up a mediocre bike, the Monster Evo is a great bike, whether you’ve dressed it up like a 1981 Pantah or a homage to VR46, or left it in this standard (and very pretty) red and white. The original 1993 Monster dictated to the market, by merely existing it helped create a generation of bikers looking for an involving riding experience, without the hassle that owning a sports bike brings. This 2011 version has been built in response to what the market is dictating to the manufacturers, offering improved versatitlity, reliability and strong every day performance. It is much more capable than previous Monsters and as such is completely deserving of the Evo moniker, and at least an hour of your test riding time.